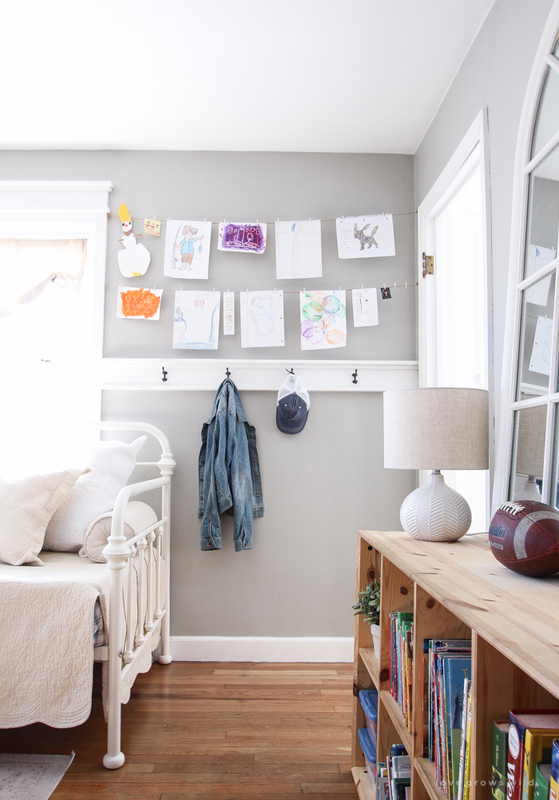 The playroom slowly… and I mean VERY slowly… evolved over the last few years as my style changed, and I swapped out the bright pops of color for a more neutral palette that matched the rest of the house. 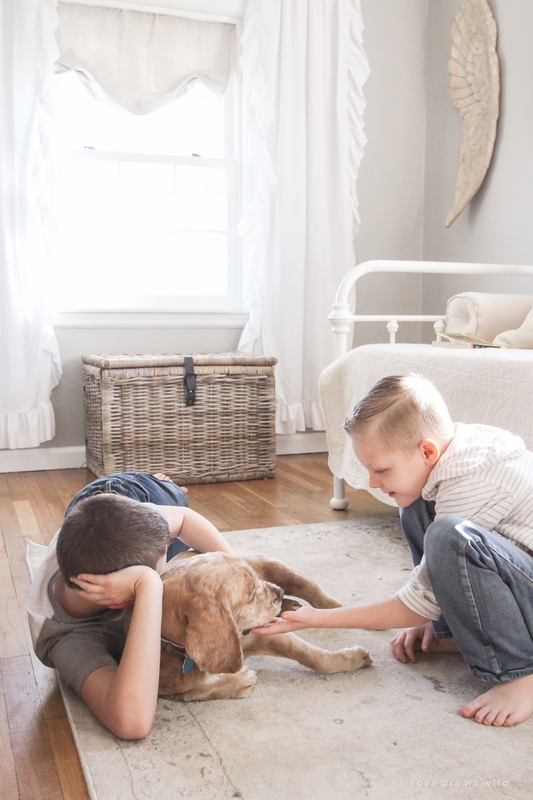 Those of you who have my book, A Touch of Farmhouse Charm, got to see the first playroom photos I’ve taken in years, and although that design was a huge step in the right direction, there were still a few things I wanted to tweak and change. Imagine that… Liz wanting to change something! One of the problems I had with the playroom was the functionality of the design. I no longer have little babies who want to set up their train tracks and drive their tractors around on the floor. 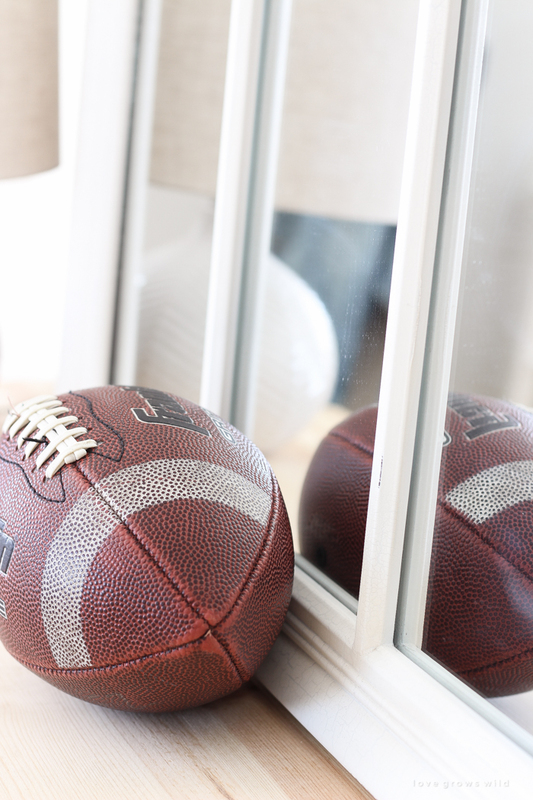 I have one boy who is just two short years away from being a teenager and another little cutie who is already pushing the pre-teen years, and their needs for a playroom are much different now. *You can find a complete source list for this room at the bottom of the post! So I came up with a plan for a more “grown-up” space where they can kick back and relax, watch movies, hang out with friends, play video games, display their artwork, read, and just be their goofy, little selves. We sorted through all their toys and donated anything they don’t play with anymore, which of course is difficult when they say, “I swear I was just playing with that yesterday!” to every single thing you pick up off the floor. Luckily Momma knows better! Ever since they were little, I’ve had them regularly help me purge their toys, mainly before or after Christmas when they get a bunch of new stuff that needs to be put away, so they’re pretty used to doing this by now. 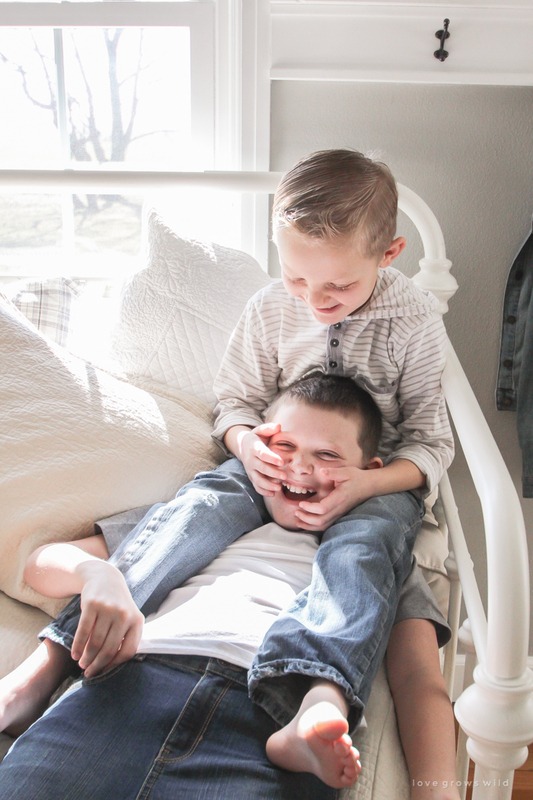 They actually enjoy the process because once we whittle their toy collection down to the things they really love, they realize it’s so much easier to clean up their room and they can actually see the toys they have instead of just a giant, overflowing mess. 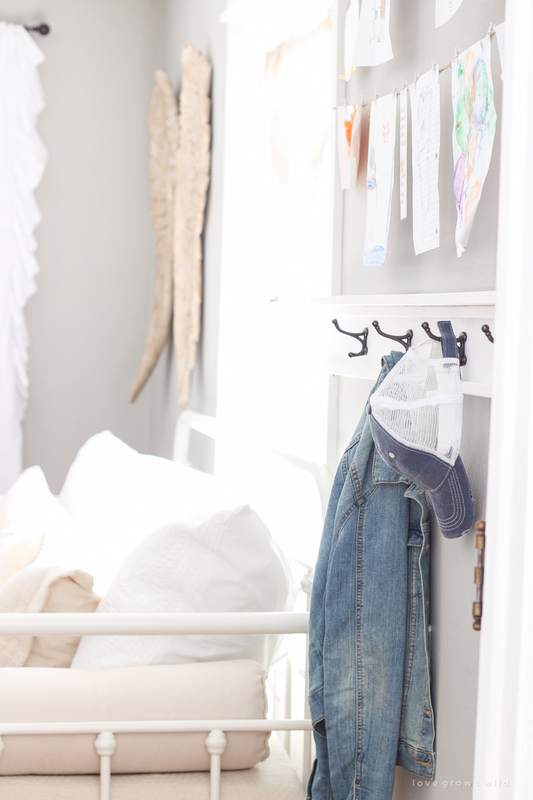 I’ve always found it important to teach them from an early age about cleaning up after themselves and taking care of their belongings, so showing them how to organize and get rid of clutter (a.k.a. 9 million McDonald’s Happy Meal toys) has always been part of that process too. I’ll show you at the bottom of this post how we organized all their toys inside the closet, but after cleaning all that up, I was able to create a really cozy space for them that I actually find myself hanging out in often! The first order of business was to create a comfy area for the boys to lounge in. I tried to find a couch that would work in this small space, but everything felt way too big and bulky. So I decided on a gorgeous daybed that could double as a couch and also a bed when friends or family stay over. 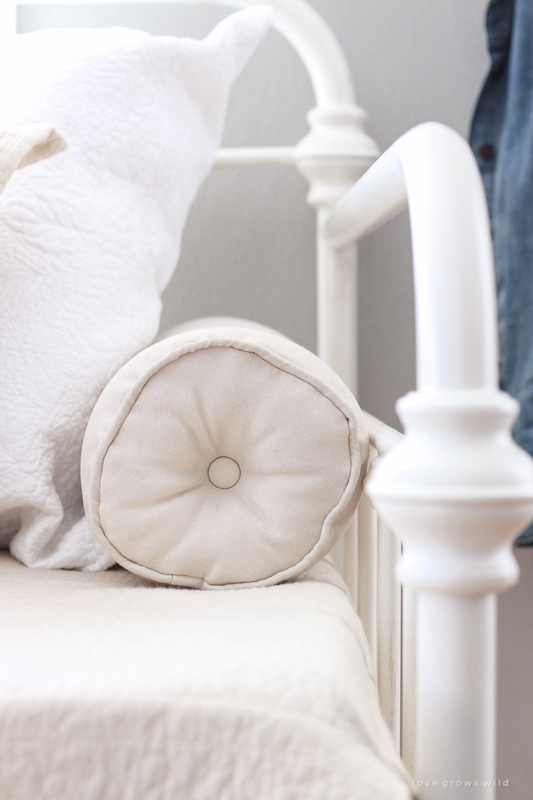 Doesn’t this bed remind you of the one in my master bedroom? I LOVE it! 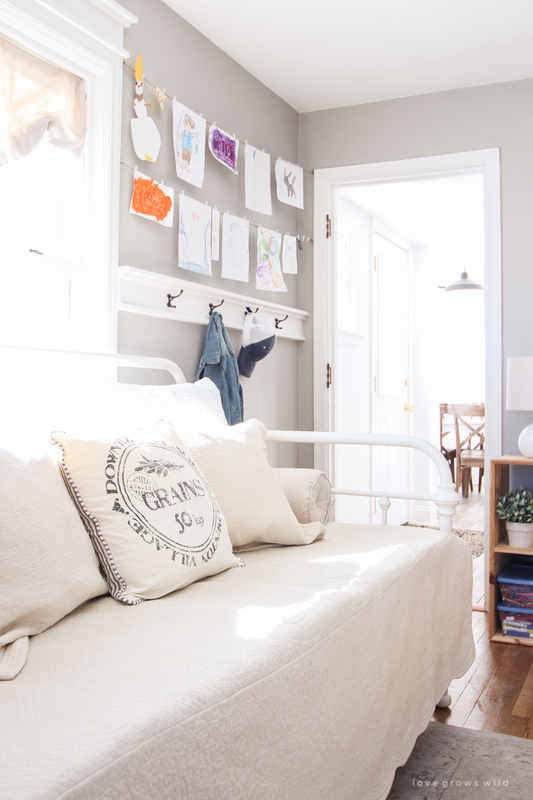 I went with a smaller creamy white version of our large iron bed frame, and I feel like because the sides and back are open between the metal bars, it feels much lighter and not as bulky as a couch would in here. I picked out a cream scallop edge quilt with matching pillow shams and a set of cozy flannel plaid sheets, then layered on stacks of other neutral pillows to give the boys a cozy place to lay back on. 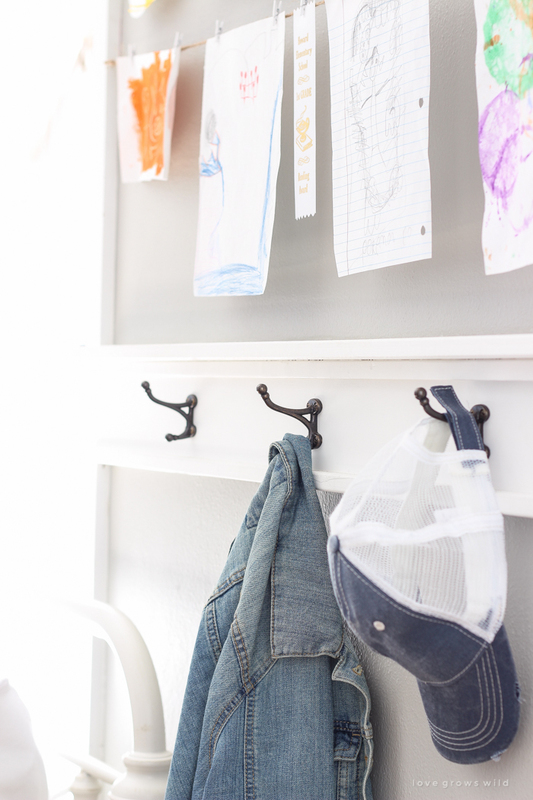 I added hooks on the wall for their book bags and coats last year (the tutorial is actually in my book!) 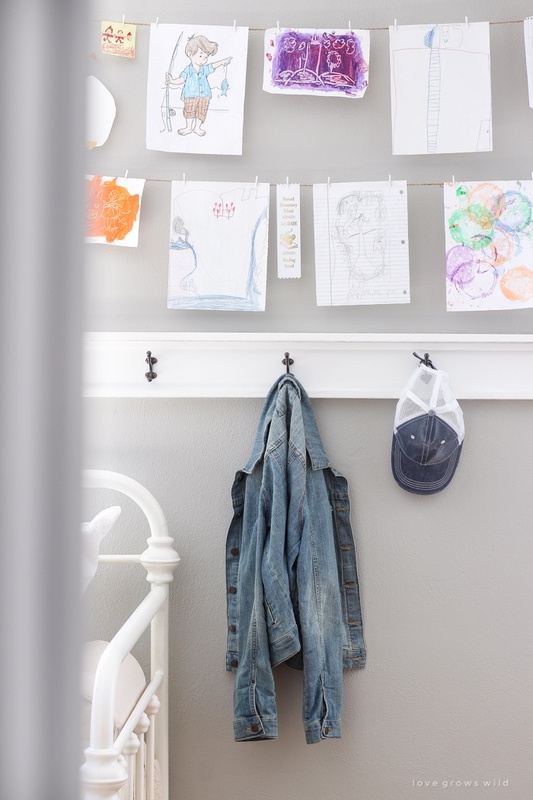 and strung some twine above so the boys could display their sweet little drawings and artwork quickly and easily. To create this display, I screwed small eye hooks into the side of the window trim and door trim and tied a piece of twine on the hooks. Then I picked up some small clips from the craft store (I found them in the scrapbook section) and hung their colorful artwork for them to admire. 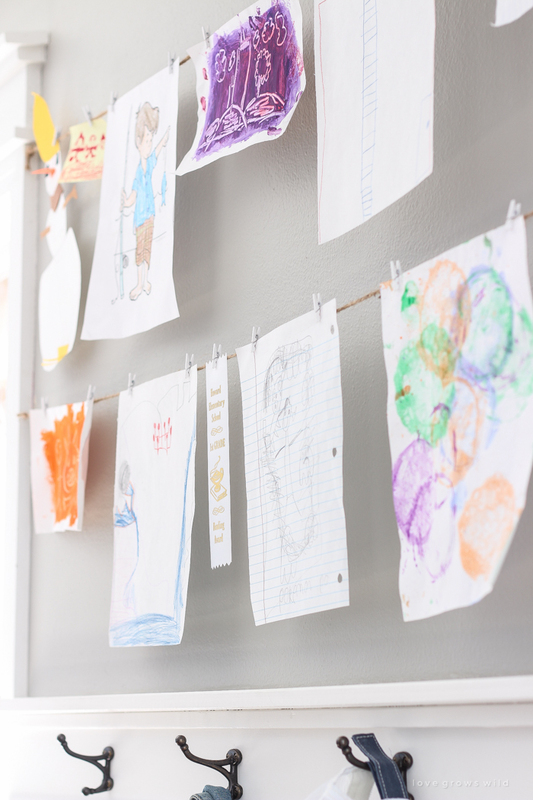 Even though I designed the playroom in all neutral colors, these brightly painted papers are the perfect pop of color to make this feel like a fun kid’s space. The boys were SO excited to see all their art up on the wall! I would like to get a larger rug for in front of/underneath the daybed sometime in the future. But for now I grabbed this one that was in our kitchen, and it works just fine without having to spend any extra money. The boys love curling up on the rug and reading or playing with their Legos, and our pup, Tucker, seems to love it too. Isn’t funny how even when there’s a comfy bed or chair to sit on, nine times out of ten kids will choose to sit on the floor anyway. Just a funny observation! 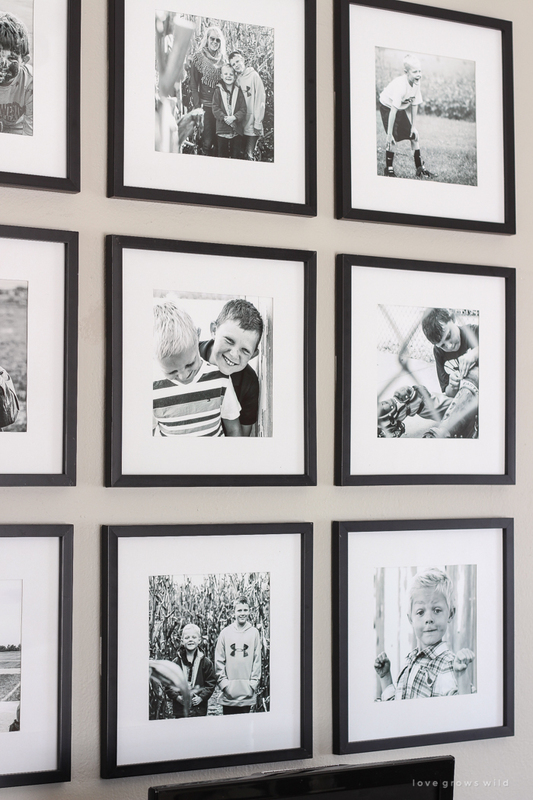 On the wall opposite the daybed is one of my very favorite things about this entire room… a simple, stunning gallery wall of my favorite photos of the boys. I feel like I take hundreds and thousands of photos every year, and they end up just sitting on the computer or on a drive somewhere. 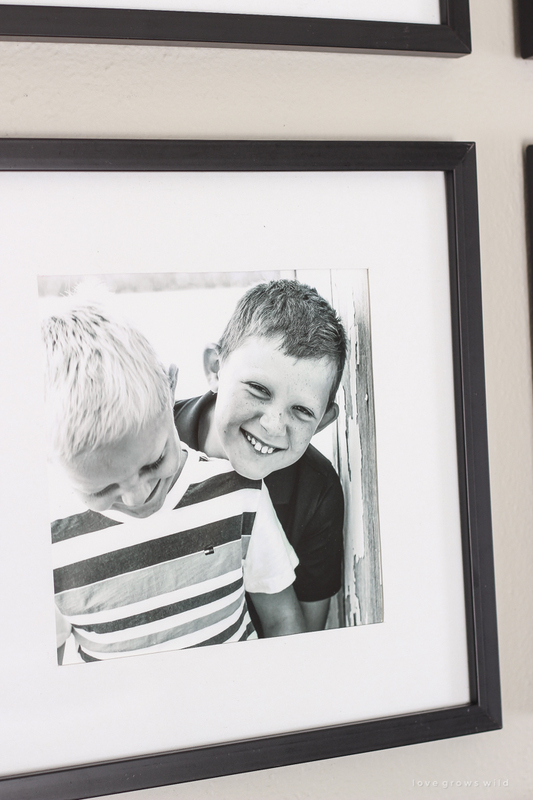 So I wanted to have a special place where the boys and I can reminisce about their awesome sports moments, silly smiles and the occasional mud fight. Good grief… weren’t they just my little babies, like yesterday?? By the way, those beautiful angel wings on the wall first made an appearance in my dining room earlier this fall, but I just never felt like I had the “right” place for them. And they’re pretty massive and heavy, which means that I definitely don’t have room to store them in a closet. 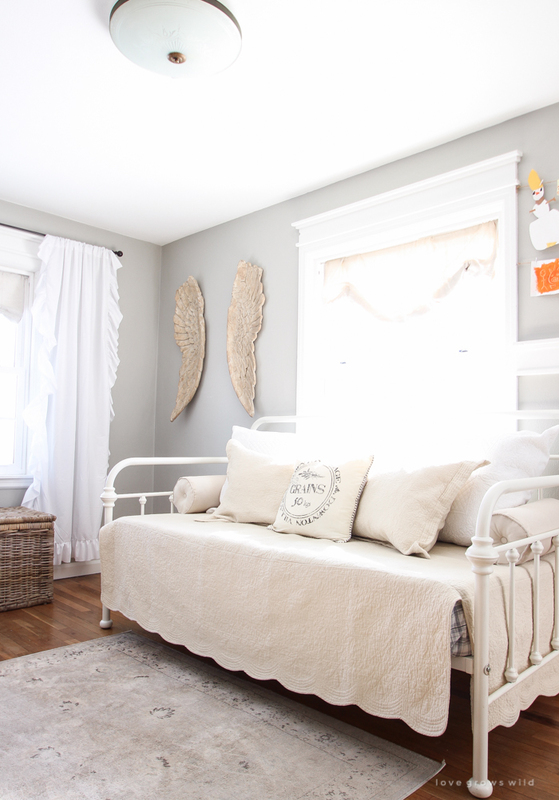 So when I started thinking about artwork for the playroom, I decided to try these angel wings in here, and I think they are perfect! 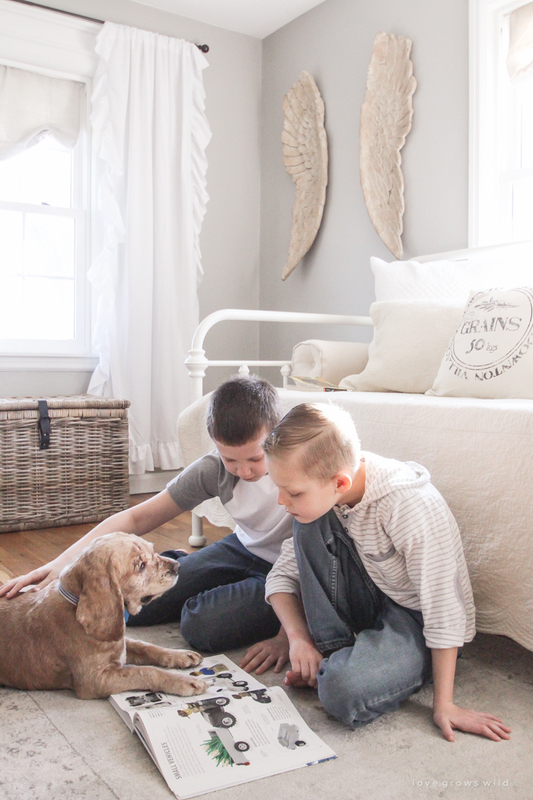 Even though my crazy boys are usually FAR from deserving angel wings, they will always be Mommy’s sweet, little angels, so I felt like they were totally fitting in here. 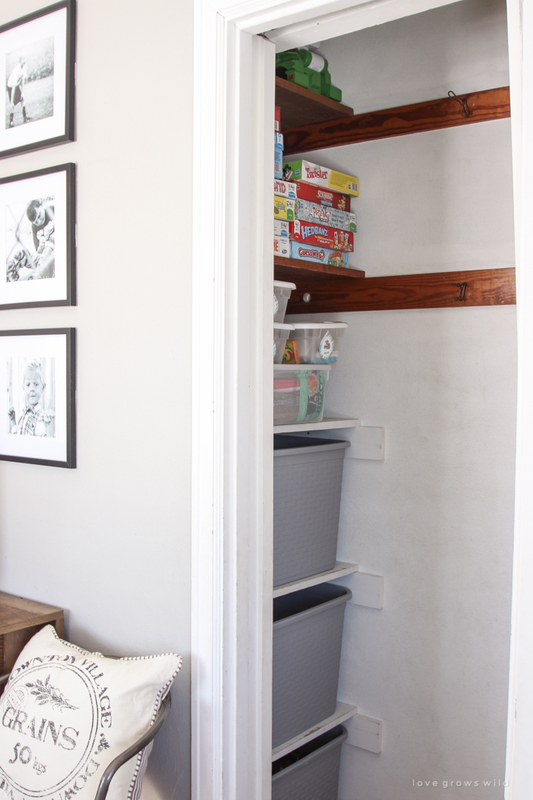 And just in case you were wondering where I hide all their toys, this little closet has been SUCH a big help in storing and organizing their toys, puzzles, games, costumes, and more. I installed some simple shelving a few years ago and bought totes to fit on each shelf. One tote has Legos, one has Hot Wheels, trucks, and tractors, one tote has random toys, and then board games and puzzles are stored above that. The other side of the closet has a bar for hanging up their costumes and dress-up clothes and another tote underneath for their plethora of Nerf guns. Yes, I know I should probably paint those boards to match the rest of the white, but I just haven’t been motivated enough to empty their closet and get it done. It’s funny how some of the simplest projects are the ones I always put off the longest! Now that the boys have this more grown-up space that fits them better, they’ve enjoyed hanging out in here so much more. You can usually find Tucker right here next to them getting spoiled with hugs and attention. At 12 years old, this old pup eats it up! I just got back on Wednesday from a very special trip to Waco, Texas (yes… Waco! ), and I promise I’ll blog all about it soon. You can see some highlights from my trip on Facebook and Instagram! 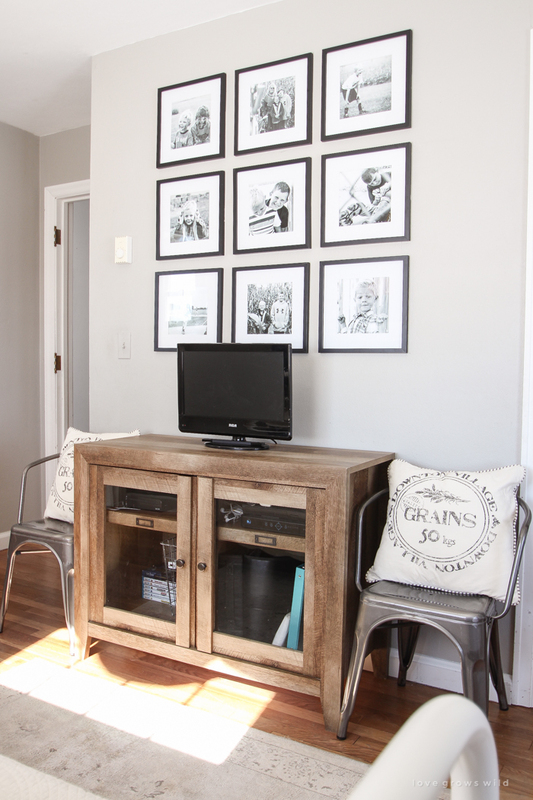 farmhouse window trim – tutorial in my new book! I have been looking for a daybed for my guest bedroom. This would be perfect. Only thing I wonder is if it would be comfortable for older guest. One more question, did you leave the door on the closet in the room or is it off? Love this room and love your style.